Pretty often we need transportation. In this post we offer you to think about Silvercar service – an amazing car rental service. Silvercar is the airport car rental experience re-imagined. Designed especially for the connected business traveler and wonderers. Silvercar delivers a fast, frictionless, consistent experience, featuring a single, premium car model every time – the Audi A4. There’s a special Silvercar promo code to get you 1 day free rental of at least 2-day rental for first time Silvercar users, and Silvercar offers $25 to first-time renters who are referred by existing customers. Use promo code FACEBOOK to get 1 day free rental of at least 2-day car rent. Once finished reservation you will get $25 back to you by email. Lets see the example: Fort Lauderdale booking…. …and minus $25 with referral code of DDUDARENKO by e-mail, when you will finish your reservation, which marks down price to $51.90 for 2 day-car rent of incredible Audi A4 for 2 days! Note, that you need to add referral code DDUDARENKO in your Account->Refer a Friend menu first before booking and after apply the FACEBOOK promo code. Or a total of $59 (discount) + $25 (return after finished reservation)=$84. 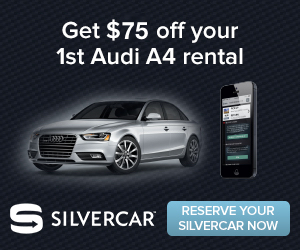 Silvercar Audi A4 cars come with free GPS, wifi, and satellite radio. If you decide to skip refueling on your returning a car, you’ll be billed at the current local premium fuel rate for exactly what you use, plus a simple $5 fill-up fee. No whole-tank pre-pays, and no exaggerated per-gallon markups. More FAQs info you can find here. Image Credits:photo courtesy of Silvercar.